In Night Pilgrims, Saint-Germain is living in a monastery in Egypt when he is hired to guide a group of pilgrims to underground churches in southern Egypt. The vampire finds a companion in a lovely widow who later fears that her dalliance with the Count will prevent her from reaching Heaven. Night Pilgrims is another excellent addition to the Saint Germain series. 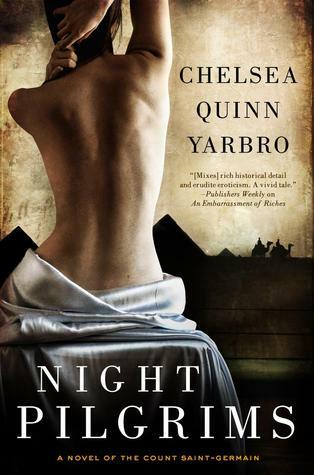 Yarbro delivers everything readers have come to expect from her novels: great characters, exquisite prose and plenty of action and passion. Yarbro's prose is always a joy to read and Saint Germain is, without a doubt, the greatest vampire in literature; he really deserves to be better known and more popular than he is currently. The storyline of this book perhaps did not thrill me quite as much as previous ones, but it was still perfectly executed and a pleasure to read. I certainly hope a new book is forthcoming again next year. In the meantime, since my tbr pile is now mostly under control, I may consider rereading a few of my favourites from earlier in the series. For those new to Yarbro's writing, please note that, while occasional references are made to past stories, it is possible to read the books in this series in any order as they are all standalone stories.